The Big House, part 17. I abruptly awoke from slumber to see darkness still outside the room, and with a squirming bladder. I went downstairs, used the privy, and then saw the low-burning wax candle stub in one of the small lanterns. Someone other than me recalled what I needed to do today – hence had put the lantern on the table – and as I began dressing in my usual cool-weather clothing, I had the intimation regarding warm-weather clothing. Faint yawning noises came from the basement, and then Sarah nearly collided with me as she 'sleepwalked' her way to the privy, then minutes later walked back downstairs. After carefully writing out the words 'warm weather clothing, for trip south', I recalled what I needed to bring. As I wrapped the dagger in rags, I heard more movement coming from below, and then soft steps on the stairs. I turned to see Sarah. “Uh, that dream was awful,” she said, as she came closer. With soft fingers, she touched my hand, and then drew it away abruptly. She then smelled it, and jerked. “Do I need to bathe?” I thought, as I smelled my arm. The intense reek, as well as the upwelling nausea, nearly doubled me up. I stopped what I was doing, and headed for the bathroom forthwith, where I bathed hurriedly. I came out minutes later feeling – and, I now noticed, smelling – much better. “How could I smell like burning l-lard if that was only a dream?” I mumbled, as I resumed packing the evidence. “Did you see the tag?” I asked. I wondered if I had time to go into the whole story. “Is this room on the second floor from the ground?” asked Sarah. “It was said to be,” I said. While Sarah did so, I resumed packing, and by the time she had finished, I was looking for the greasy bundles of wadded paper I had confiscated from various witches over the last several months. I recalled bagging them, and as I found the bag – tied, with a stamped tin label – I heard steps coming from upstairs. I turned to see Anna. “We can take you today, if you'll wait an hour or so,” said Anna. “The second posting?” I asked. “Uh, I'm not certain...” I mumbled. “I think so too,” said Sarah. “What are they like?” I asked. “Especially if it's the most expensive type,” said Anna. I jolted, then collapsed where I sat, and I reached for my mug. My mouth went dry with such rapidity that I didn't pause until I'd gotten the first swallow down. I stopped abruptly upon realizing what I was gulping down. I left with a full bag and much else but a short time later, and as I headed south in the darkness, I marveled at all that I had heard minutes before. I felt my water bottle, then my possible bag, and when I felt an 'odd' shape in the latter, I stopped in my tracks and knelt by the side of the road to examine the bag. I had found a third ledger, and as I flipped through its pages quickly, I noticed not merely maps, but text and blank spaces. I replaced it and resumed my southward trip seconds later, now knowing my sensing was correct. I needed the time to not merely find the place, but if possible, meet with Gabriel. “They don't tolerate lateness in others?” I asked. “What?” I gasped, both at hearing confirmation of what I had sensed in many places – and what I recalled one of the three tailors speaking. “Did he speak a rune-curse?” I asked. “Tested?” I asked. I still did not understand. I suspected my attention was hopelessly off-topic, as I was watching where I was going. “Did he mean to sacrifice me?” I asked. As I sensed the 'rise' ahead – it was starting to lighten to the west, which meant at least another hour before the start of the second post – I recalled Sarah's emphasis on the word 'that' when speaking of cloth. “That stuff is c-celluloid?” I gasped. “And its durability?” I asked. I recalled reading of 'celluloid collars', and to hear of things like them made for a nightmare. “That, and then dusting with salaterus,” said the soft voice. I came upon the rise but minutes later, and from there, reached the house proper as the sun was starting to actually come up. “There was mention of a trip, and I hope to go on it,” he said. I left the man at his post and low-burning watch-fire, and before I had gone twenty feet, I heard soft snoring noises. I was glad he could snore, even if sleeping on watch wasn't a good idea. After changing into my 'greens' and then fitting my usual equipment, I went to the refectory. The place was beginning to become crowded, and as I waited for a fill of cider and a slice of bread, I looked around in hopes of finding either Gabriel or one of the two scribes. All of them seemed absent, so much so that I was astonished to see my plate delivered up along with a filled bottle and mug. “Why?” I asked, as I woke up completely. The distraction of learning about 'a ghastly stench' was only broken by the other more-important portion, and I recalled it just as I was about to eat the bread. “And those scribes? Gabriel?” I asked. I recalled clearly the route to the privy, and only once I had passed it did I slow. On each side of the dim hallway were narrow varnished doors, and as I began looking for the 'names', I heard a faint yawning noise, then the sounds of stretching. The door I had gone toward now opened slightly, and to my astonishment, I saw Gabriel. He looked as if he'd just awoken. “Let me visit the privy, and we can go over what is to happen shortly,” he said. “Come inside, and find a chair.” He then ducked out, and hotfooted it down the hall. I cautiously opened the door, then looked around to see a near-barren room holding little beyond a desk, three chairs, a bookcase – there were a fair number of books present, though their age and seeming decrepitude spoke loudly – what might have been a cabinet of some kind, and part-hidden, a strange-looking edifice that was a cause for out-loud wondering. “Is that a stove?” I murmured, as I pushed the door closed and sat down in the nearest chair next to the desk. While there was no immediate answer, I began looking at what was next to the stove. A slightly grimy container sat amid small and faintly dusty mounds of sawdust next to the stove, while a well-used short-handled saucepan sat atop the thing. This last steamed slightly, and as I was about to get up and look at it, the door shook and then slowly opened with a faint grinding squeak. “Is that a bathing dipper?” I asked. “What do they say?” I asked. I reached into my possible bag, then drew out the new ledger. Gabriel began looking at it, and within less than a minute, he was muttering and turning pages. “You don't realize what this is, do you?” he asked. “The Compendium Set has perhaps part of a column setting out what is known of that area,” said Gabriel, “and at least half of that information isn't trustworthy. This...” Gabriel paused, drank deeply, then resumed looking for a few seconds. He then spoke. “Is there more room available for additions?” I asked. “Perhaps the destruction in the Swartsburg has toned them down slightly?” I asked. “Travel?” I asked, as we went along a darkened corridor. “Did they go home?” I asked. “Long meals?” I asked. I could see a door ahead. “Recording the meal?” I asked. “I think I might have a key,” said Gabriel. I moved around him, touched the doorknob, and the lock beneath it audibly clicked. “Was that a Dietrich you used?” asked Gabriel. “What is a Dietrich?” I asked, as I gently pushed the door open to show a darkened room. “Maagensonst?” I asked, as I looked for the wall-lanterns. They seemed to be 'missing'. “Did you take notes for your traveling partners?” I asked. As I fumbled in my bag for a candle, I heard Gabriel looking for something, and the hissing scratch of a match startled me. I looked to see Gabriel igniting a stubby candle, then inserting it into the lantern. “Was that a match?” I asked. “And you bought some anyway?” I asked. “What do you do with those?” I asked. “Is that how sealing wax is done?” I asked, as I looked around the room in the dim light. “How much is that wax?” I gasped, as I walked toward a pair of tables at one end of this sizable rectangular room. I was struck dumb by the pronouncement I had just heard, for I had the impression the stick in question was perhaps the size of a finger. I was about to ask further when I came to one of the tables. “Do these people behave as if, uh, pickled?” I asked. “As in they own the furniture here?” I asked. “Aye, or so they act,” said someone else's voice, as the room became brighter with stunning abruptness. I turned to see someone coming with a pair of tall brass student's lanterns. “These are the calm lanterns,” said the man who had come. “I'll bring in four more, and hang them on these stands.” I then noticed one of the 'stands' in question next to the wall. “Those cause blindness,” said Gabriel. The two stands he had indicated were opposite from us, and after he'd hung both lanterns, he returned the way he'd came. I then saw the layout of the room better. The room itself was roughly thirty feet wide, and forty or so feet long, with a long oval-shaped table in the rough center. Surrounding this table were old-looking chairs, and next to the strangely white and glistening walls were dark-colored 'heavy-looking' wooden tables. Lampstands stood about every dozen feet next to the walls, while to my left and behind were both the one cabinet and clothing rack. A closer examination of the table showed it to also be of 'heavy-looking' construction, with a prominent dark 'grain' and darker-yet lines showing the places where the planks were joined together into 'sections'. “This table seems about a hundred years old,” I softly murmured. While I knew the people in question would run late, I kept such thoughts to myself, for I suspected Gabriel would wish to read the new ledger carefully. I also knew I needed to have my 'evidence' handy, as I suspected I would receive some answers beyond what I had yet heard and suspected. Finally, I recalled the pouch I had received from Anna recently, and knew I needed to look at it. “Where should I put my equipment?” I asked softly, as the 'lighter' returned with two more candle-lanterns. Gabriel turned around, and noted the 'service' door, and he motioned to it. I stood, and walked over to the door, and tapped gently. The door opened some seconds later, and as I walked past the threshold, the stench of bad meat mingled with strong spices seized the nausea center of my mind. I gasped, saw a brown door to my left and ahead, and crashed through it blindly. I then saw what looked like a free-standing 'shield'. I ducked behind the cloth-and-lath shield and nearly pitched into an elongated metal tub. “Do they bathe?” I asked. “Hence the food and drink I brought with me only,” I said. I felt my bag, and recalled what I had in it, then chuckled quietly. “Still no good,” I said. “About the only way you'd manage is if you went downstairs and drew the stuff yourself from a cask in that 'cellar'.” My gorge arose with the recollection of that smelly room. I then looked at what I'd brought, and sniffed. “Did they dose this cider?” I thought. “They think you to be like most guards that way,” said the soft voice. “May I examine it?” asked Gabriel. “Did you notice the scale?” I asked. “What else showed?” asked Gabriel, as I returned the magnifier to its leather pouch. “Especially that one,” said the soft voice. “Uh, a 'vassal' key?” I asked. For some reason, I felt reminded of a peculiar 'ring' I had read of, and as I tried to recall the ring's inscription, I recalled clearly what it supposedly did. “Then why did Koenraad 'deliver' it?” I asked. “And going after the people I live with,” I muttered. I then brought out the leather pouch, and untied its loose-seeming knot. Upending it showed a pair of small buttons, complete with clips on their backsides, and after looking briefly at one – a neat clean execution showing a sword and shield – I found what might have been a small hole in my greens. I inserted the button, attached the clip, put the pouch back, and then resumed my former activities. A few minutes passed, and when I looked up from my busywork, I noted a well-lit room. I thought to listen, and faintly, I heard the rattle of unlubricated bearings and the clopping of four-horse teams drawing 'fancy' buggies. I tried to 'see', and felt as if blocked. “They'll be here soon,” said the soft voice. “Are we wasting our time?” I asked. “Where are they?” asked Gabriel. “They're dressed like misers?” asked Gabriel incredulously. “What do they know?” asked Gabriel. “They just saw them?” I squeaked. “And spiking heads?” I asked. There was no answer, beyond what I'd previously heard. A faint clink seemed to answer me, and seconds later, I heard a 'Lurch-Pang' chorus. The true-step of witches was coming, and I recalled all of these people as being so. “And is well-accustomed to being pickled,” I muttered. Gabriel looked at me, for some reason. I glanced at him, then at the door, which seemed to faintly vibrate. I clearly heard the scuffling clumsiness of drunken 'savages' trying to open a contrary door with a badly-worn key amid the clinking of bottles and much else. The door opened with a banging crackle, and I stood with such abruptness the chair toppled over. My right hand instinctively went to the hilt of my sword after undoing the flap of the holster, and as these men walked in, they glanced in my direction. And froze as if in the chill blast of a blizzard. No, that wasn't quite the case. I had gotten under their skins as well. Even Freek had taken notice. As the smell of strong drink and rotten meat usurped the room, I was amazed at how I wasn't acutely ill with the stench, and I thought to glance at the wall nearest me. One of the lanterns shed a faintly flickering light upon what looked to be a grotesque carving, and as I looked closer at this carving, I faintly smelled the aroma of distillate. I turned to see two distillate-fueled lanterns being 'arrayed' on the table. One of the 'stinkers' brought forth a match, and raised his boot. Here, I saw the pointed toe and black leather I had 'seen' earlier. He then struck the match. It popped, and the flaring head flew across the room to land on the floor. “Watch that,” hissed one of the other 'misers'. He ignored the hissing 'curse', then brought out another match. This one didn't work at first, and after three attempts, I could almost see smoke coming from it. He laid it on the table, and as he reached for another, the used match ignited with a pop and a flash. It also flew several feet in the air toward the lantern – and then fell down the brass chimney, where it went out. I smiled faintly, even as another of these smelly men assayed lighting the other lantern. The distillate stench was becoming stronger, and as Freek himself made to strike another match, the 'lighter' arrived with two musket-toting guards. I could almost hear Freek speaking a curse followed by the words, “so what.” I made a motion to stand, then the chair behind me slowly scraped across the floor. I stood, and slowly walked toward the nearest lantern. Everyone in the room seemed frozen, and when I came near one of the 'misers', he backed away. I could almost smell the fear on the man, and I saw the glances at the hilt of my sword. I picked up the lantern, and turned down its wick until the 'wheel' felt 'empty', then picked it up and handed it to the 'lighter'. He seemed grateful, and I turned toward the other lantern. Freek himself seemed to be guarding it, and as I came closer, he seemed disinclined toward giving it up. He looked at me with unconcealed rage. I flatly ignored his expression. I didn't wait for an answer. I reached toward the lantern with my left hand, and to my surprise, Freek gave it to me. The crestfallen look on the man's face was merely a facade, and I turned my back to him deliberately as I picked up the lantern. I used his 'fellows' as cover while turning the lantern's wick down into the reservoir, then handed the lantern to the 'lighter'. I again used the other 'misers' as 'cover' while I returned to my chair, which I pulled in while sitting down. The 'lighter' left with both lanterns, and the 'preparations' resumed. The 'elaborate' nature of these preparations – ledgers, pens, ink-bottles, bleached-white rags – was such that I marveled, for each setting received all of those things, followed by a sizable dark green bottle of wine and an equally dark-green 'wineglass'. The shape of these glasses was intriguing. I had expected to see 'stereotypical' wineglasses with long thin stems, but these streaky mottled green things were unlike any glasses I had seen before. Their wide mouths, thick rounded 'rims', voluptuous tapering, 'plump' waists – compared to what I had expected, they were 'plump', anyway – and thick uneven rimmed bases were something of a marvel. The odor of the tawny yellow liquid that began to fill them wasn't a marvel, however – its appearance was noxious, and its odor, vile. It made for retching that I could not conceal, and when a cup and bottle 'appeared' before me, I had an answer ready to hand. The silent hungry-looking glares of the 'misers' seemed to fasten upon me, and I picked up the bottle by its long dark-green neck, then uncorked it. I stood, grasped my nose with my fingers, then took the bottle through the service door, down the hall, and turned right into the kitchen. There, I saw 'punch' being prepared, and I emptied the bottle into the noxious contents of the punchbowl, then stood it up next to the container. The resulting 'mess' smelled acutely poisonous. “Now what did you put in there?” asked a cook. I wondered how he could endure the stink. “It includes arsenic?” I squeaked. “Problem solved,” I said, as I left the kitchen. The stink seemed inclined to follow me, and only when I returned to the room was I able to unclasp my nose. As I took my seat, I noted the still-glaring expressions of the 'misers, and as I looked closer at them, I noted the near-monotonous sameness of their over-serious expressions. I then glanced at the head of the table. 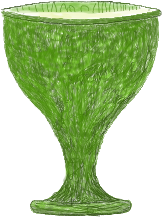 Freek had finally taken his seat, and was drinking deeply of his 'glass'. Freek nearly sprayed his wine, and coughed before attempting speech, and what came out was a mumbled epithet in a language I recognized at once as a dialect of German. I looked at Gabriel; his face was unreadable, at least until he stood with the neat-stacked paperwork. There was my ledger, and what looked like a slim leather 'binder' that I had not seen before. He moved these to the nearest miser, and that man passed them up the table to the one next to him without glancing. As I watched the paperwork working its way up the table, I noted a possible 'hierarchical' seating arrangement, with those 'lesser beings' seated at our end, and the 'lord and master' seated at the other. Still, I wondered as to the arrangements more than a little – until Freek himself began looking at the ledger. As Gabriel slowly spoke of what was in the documentation, I seemed to listen carefully. Much of what was happening was an obvious smokescreen, with the attention of the entire 'council' feigned. I thought for a moment as to the mention of 'correctness', and made a possible connection. A cough came from the other end of the table, and I saw a lacy white 'handkerchief' in action. For some reason, I seemed to see the 'mite' clearer, then suddenly my sight 'zoomed in' to see a blood-tinged mass of green mucus. As I listened to Gabriel continue, though, I became aware of something I had not seen prior: he was 'head and shoulders' above these people in raw intelligence. More, they wanted to give him the Judas Choice, that being either making his bones or bleeding on their altar as the object of adoration. I lifted up my head to gaze at this man, and watched him again wipe his mouth after coughing. As he listened, I could hear again tones in that 'German' dialect, and the connection between what I heard in the dream became utterly clear. Gabriel had now come to the part where he spoke of the hordes of Norden, and how our utterly controlled lives conveniently played into their hands. As if to confirm matters, Freek suddenly 'shouted' for silence, then in a low and threatening voice spoke directly to me. I listened to what he said, then somehow heard Gabriel speaking normally. “Calling me 'bhoy'?” I asked. I looked again at Freek, and heard Gabriel coming to the end of his spiel. I myself would be asked for shortly thereafter. I thought to respond 'appropriately'. Freek seemed at a loss, for he but now saw my hair. It occurred to me that the usual 'shade-of-blond' was all he had ever seen. Freek took the matter with a measure of aplomb that surprised me. Freek was about to speak. I put my hands on the table, then spoke before he could manage to 'silence' me. I looked around, and saw I 'held' the table. I then continued. Someone was about to ask a question, and I looked at the 'miser' in question. My single thought was 'silence'. The man nearly collapsed in place, and once 'recovered', he began guzzling his wine. “How will they bring them?” asked Gabriel. “They have spies here?” asked Gabriel incredulously. “He's not interested in that book,” I thought. “Then what do you drink?” shouted Freek. Gabriel looked at me with open mouth, which he promptly shut. He then spoke. “He really doesn't want to hear that one,” I thought. Freek brushed off the reference with a brusque wave of his hand, then passed the documentation back down the table. As it passed back our way, there was a nervous gabble of discussion that brewed in its wake. For some reason, I saw – and heard – otherwise, even as the recollection of the behavior of some middle managers I had encountered seemed to be played out before my eyes once more. 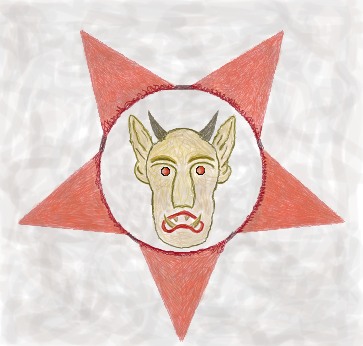 A glance at the nearest of the 'misers' caused the clothing of his arm to become gauzy, and amid the crusted filth covering his skin I saw a tattoo of familiar form – that feral half-man, half goat hybrid with horns and fangs within a five-pointed reddish star – and as the fabric resumed its dirt-shrouded dark brown hiding, I knew what I was seeing was correct. These were the people of that dream, and I had just seen one man's owning tattoo. “Ye glass, you mean,” I thought. I could clearly hear that medieval tone in his voice. He paused to drink deeply, then resumed speaking. “Where are you from?” he asked. For the first time, he was speaking in a semi-civil tone. I thought to answer, when he spoke again. I instantly felt a pang of fear too great for words, which was just as abruptly squelched.